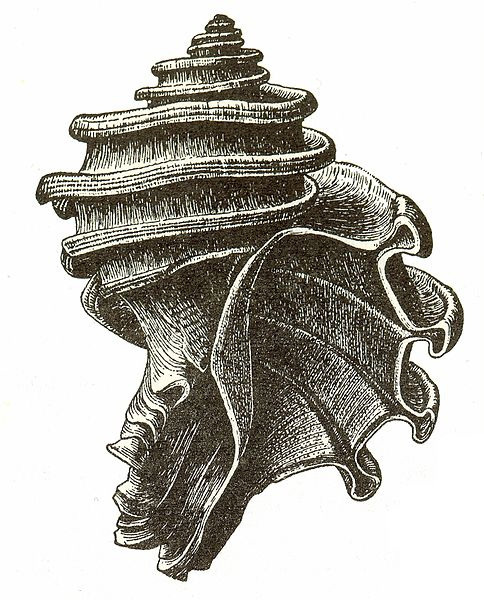 Illustration of Ecphora gardnerae fossil shell; public domain image on Wikipedia. This extinct snail inhabited Chesapeake Bay and other East Coast tidal waters 5 million years ago in the Miocene era. Various species of fossil Ecphora are fairly common in the Miocene strata of Maryland (in the areas now occupied by Chesapeake Bay, parts of Southern Maryland, and the Eastern Shore). This fossil snail was one of the first fossils from the New World to be illustrated in a scientific work in Europe (England, 1770).